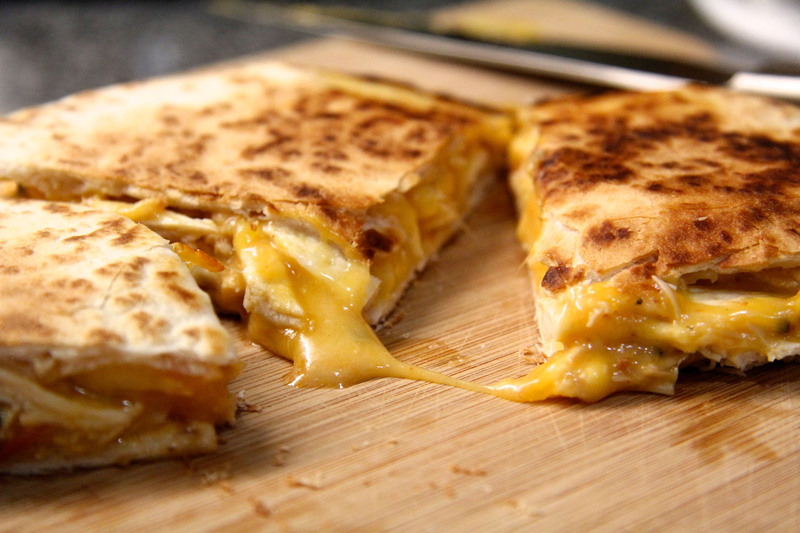 This quesadilla resolves two problems for me. The first one is I’m tired of sad looking quesadillas that are barely filled with protein. It comes out thin with some cheese and pieces of chicken or steak. You almost feel like you are eating mostly tortilla. 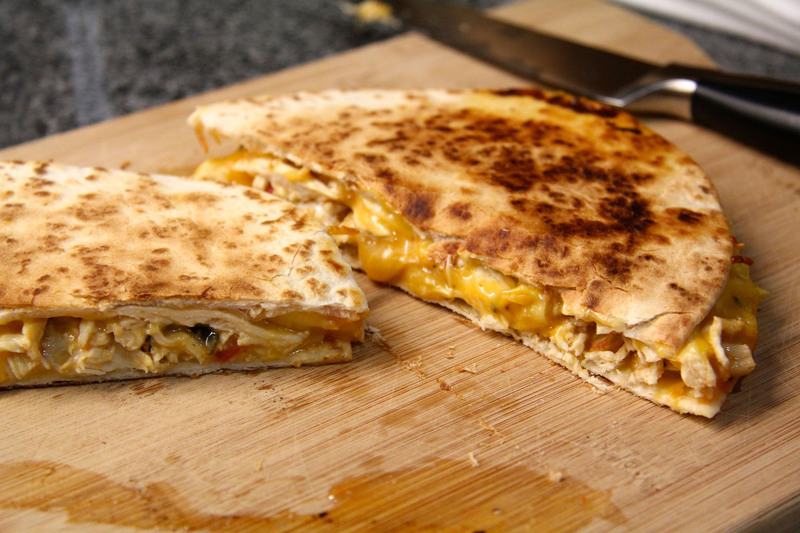 The second problem with quesadillas is that it can be unhealthy if you get it at a restaurant or taqueria. The protein tends to be greasy probably made with lard and the cheese is not high quality cheese. The tortilla may even be made with fat. You just don’t know how bad it could be. 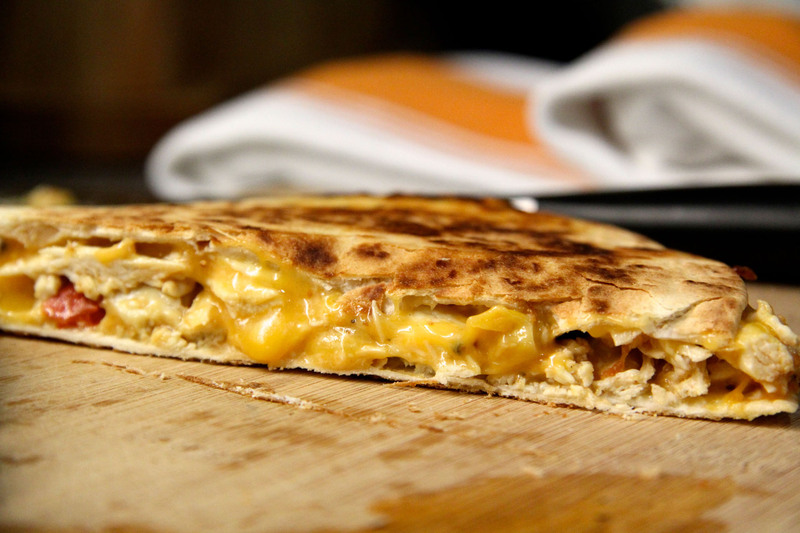 In actuality a quesadilla doesn’t necessarily have to be all that bad for you. If you think about, it it’s two pieces of really thin “bread” aka carb filled with some protein and some cheese. Be smart about what you put inside of it and pick a low fat or healthy tortilla to use and you’ve got yourself a great snack or meal that doesn’t have to be guilty but still taste great. There are a few simple things you can do which will make it a guilt free meal. Use a healthier tortilla (look for ones with lowest fat content, calories or find ones that are whole wheat or made with spinach or have flax seeds in them etc) The next thing is, use low fat shredded cheese. Trader Joe’s has a low fat mexican blend which is great. This will help cut down the fat. Finally use roasted chicken breast meat or even turkey meat. You can find pretty much 5% fat roasted chicken or turkey meat. 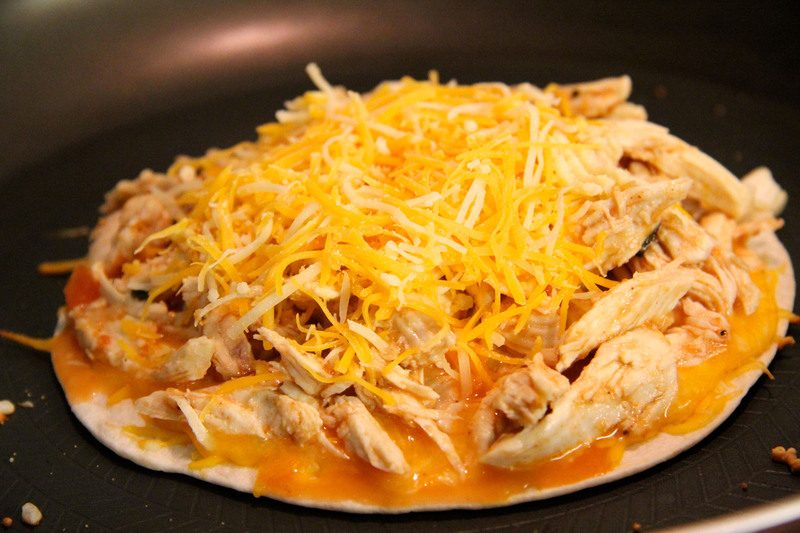 This is essentially the leanest type of protein you can stuff into your quesadilla. And be generous! Layer the chicken as much as possible so you get more protein in your bite than anything else. And there you have it-it becomes a high protein, low carb meal that almost feels like a cheat meal when it isn’t:) How great is that? Not to mention, ridiculously easy. Make adjustments and add spinach or fresh veggies to the filling or top with your favorite pico di gallo for some extra veggies and kick. 5. 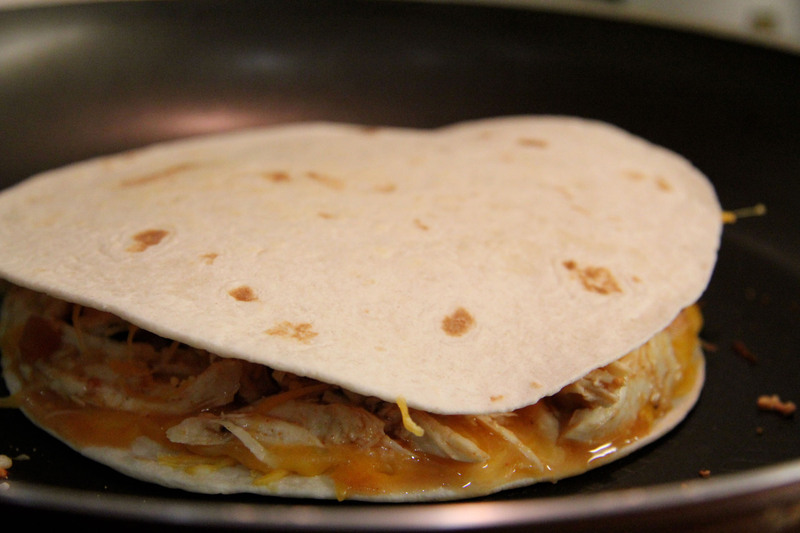 Place your other piece of tortilla on top of chicken cheese mixture and press down. 6. 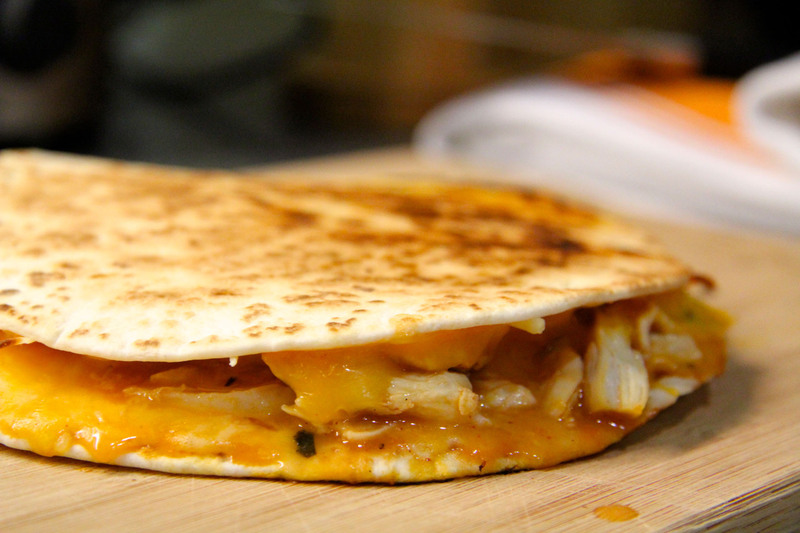 Now flip the quesadilla over to the other side so you can melt the other side down. Add the other 1/2 of the tsp of olive oil and spread by moving the pan side to side so the oil coats the bottom of the quesadilla. The little oil helps with browning. 7. 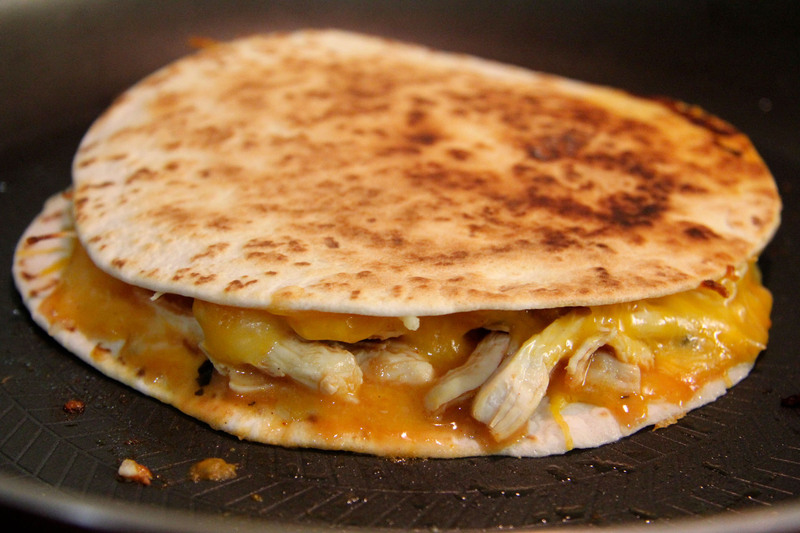 This will allow your cheese to melt into the other side of the tortilla. Again let it slowly cook while the tortilla slowly turns golden brown and crispy. 8. Once the cheese completely melts you can cheese the sides to see to make sure. 9. 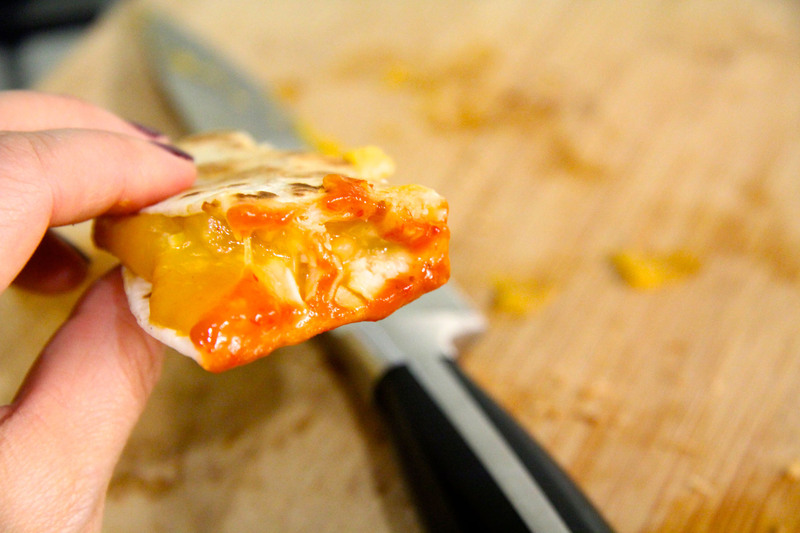 Then remove and place onto a cutting board and slice into 3-4 pieces. 10. Dip into tapatio or red spicy salsa or enjoy on it’s own.